The average rating for all maps is -228,488.2 . The month and year ends and here we have our 12th MOTM for 2007. This MOTM is a tag-team map, in fact with the very same tag-team as before: Crackling and Testbug. However, the tables are turned for this map, and it is Testbug's very unique map which is given a make-over by Crackling into the solid, playable, and very standard map you see before you now. The map is fairly simple with mains in the corners, regular 9 block main, gas expo nat, min only, then another expo with gas. However the execution of this familiar theme is unique. The mains are on lowground with the nats on highground, something rarely seen in maps like Requiem or Reverse LT. The mineral only is on the main layer of the middle of the map, are large lowground plain which encircles a large highground plateau with ramps for easy mobile-access, like the middle of longinus. The mineral only expo is close to the nat, but is certainly not a "free" expansion site. Past the mineral onlys are highground plateau expos, lead-to by 2 seperate large ramps, one larger than the other. The smooth expo layout of the map is fairly standard and supportive of the common macro-oriented play. The expo layout favours a push or creeping style expansion, taking one base at a time as you head towards your opponent, but fluidly allows players to pick one expo over another. While perhaps not the most exciting and strategically oriented expo layout ever, it certainly is player-friendly, and makes scouting quite imperative, with expos so easy to "hide" in. A smooth transition from open to tight exists in this map, with the open not being too large, and the tight not being too constricting. Many chokes and ramps allow for strategic play without disrupting unit movement in any manner. Your armies can easily march around, with players flanking eachother and cornering eachother, without getting lost in space. With a very for-the-player expo layout, large but not vacuous mains which allow players to comfortably fit their buildings in the space without feeling as though they have to be master architects to fit everything and still have room to breathe but without making the players feel agoraphobic, and a familiar but still unique execution of the map's placement and altitude variation, Crackling and Testbug's Shakras is a great map, well worthy of the title: Map of the Month. Spam the map's thread here. Grab the map itself to pwn your pals here, and observe and be observed on the map's observer version here. Almost all of the votes this month went either toward Shakras, or Ptar's Lost Soul. This older map of ptar's was one of ptar's early small-big-hit maps. The map itself might be described as being fairly standard and "macroish", but the map's unique size and proportions keep it from being "just another map". The map has a lowground main, standard lowground nat, not far from the nat lies a lowgruond mineral only, and a riskier but with-gas-expo on the map's large middle highground plateau, and farther from the linear action lies a lowground expo with gas. The expo layout is comfortable and easy to grasp for players. There are a lot of expos, especially for a small, 2 player map, but Ptar counters this with fewer mineral blocks at each expo, and with many blocks modified with lower values. The main features 8 blocks, the other expos have 6 blocks each. Though the map's size limits it somewhat, the lower monetary value of the expos, and the spread between the map's gas along with a fairly open middle allow players to feel comfortable and not terribly cramped as they try to macro their way through a smaller, more micro oriented map. Spam its thread here, download it here, and get the obs version here. The two maps tied for third have relatively few votes each; if you combine the two third place maps' votes the resulting sum is still less than both second and first place maps; in the past we have had some very close third place maps. The maps were Titanwing/Moebius' Orpheus, and flothefreak's Frosty Fortress, a map I am so god-damned tired of seeing it'll drive me insane if I see it again, a map which has failed to get MOTM but managed its way into the top three a fourth of a dozen times, and you can read about it in recent MOTM threads below this one. Also to note: 2007 is over, Happy New Years Broodwarmaps.net! 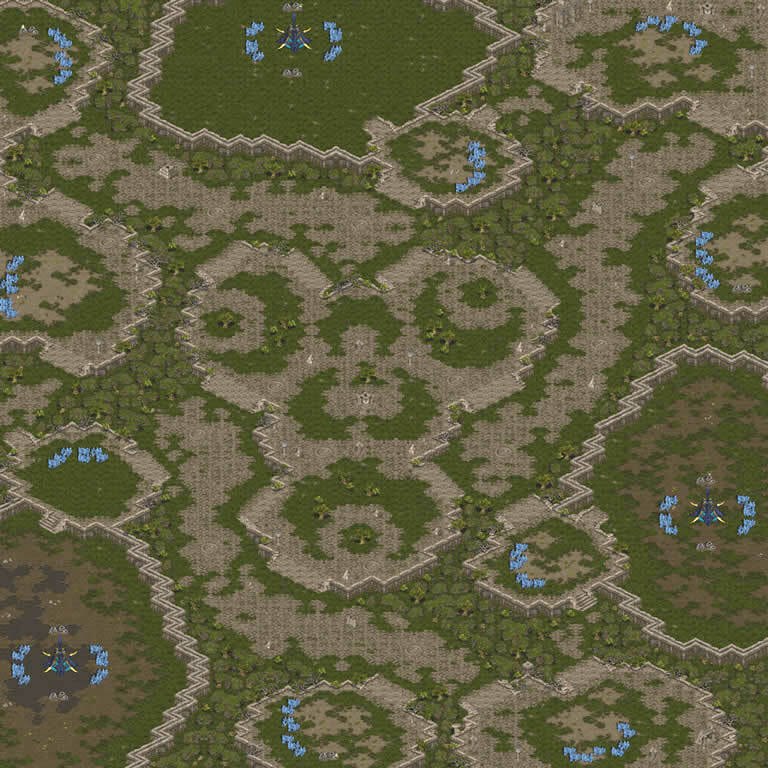 I hope 2008 brings sc some great maps before sc2 comes out (whenever that may be (cough ghost cough)). With the holidays ending, I hope the site will see some more activity, it's been a little slow as of late. Hopefully we'll see many new great maps, and a lot of testing of maps by various people. Remember to bring your friends to op bwmn to test maps. I've seen basically no one in the channel through the bot since I started hosting the bot again. With the year having ended, the 12th MOTM doesn't quite conclude the year, but MOTY does. Please bring your votes to the (2)MOTY, (4)MOTY, and Experimental(E)MOTY. You'll find these competitions near MOTM in the lower right side of the site's page. ...Next time on Newsposts with Nightmarjoo: Nightmarjoo meets the paragraph break! (just kidding -.-). Congratulations to Crackling/Testbug and Ptar. This MOTM was a race between 3 maps, Seven Sins by Tesbug, Frosty Fortress by Flo and Morris Plains by Nasty. At several times during the voting the switching of votes placed one ahead of the other. These 3 were clearly the top maps and the admins picked MOTM among them. Ladies and gentleman, this is a historic occasion for Broodwarmaps, we present to you our first ever 7 player MOTM, Seven Sins! Seven Sins is a 128x128 seven player map intended for FFA or team play. It is not intended for 1 vs 1 games as it has the potential for positional imbalances although it is still fun to play then as a challenge. Each position is quite different with unique advantages and vulnerabilities to exploit: high ground mains, low ground mains, in-base nats, nats with two chokes, mains with 2 chokes, island expos, expos with 2 chokes, expos with entrances blocked by neutrals, you name it, and all made with Testbug's characteristic artistic flair. This map was exciting enough to be chosen by the folks of PsiStorm.eu as the map to be played on their "Fun Night". Congratulations testbug, but be careful, winning MOTM can become addictive! Read the map thread here, obtain the map here. The second place goes to Frosty Fortress made by Flothefreak. This map that had already won second place in the past MOTM still has enough "oomph" to put up a fight. As has been remarked before this is a 128x64 map that blends a macro-map expo layout with a micro-map design. Do not be misled by the 6 gas expos and 2 minonlies into thinking you can "take it easy" here, the short main to main distance makes the margin for error very small creating intense battles that test your skill at micromanaging units. There is some concern that the map may have some degree of race imbalance but the map concept and its execution make the second of our top 3. And last but not least, the third place goes to Morris Plains by Nastymarine. This beautifully laid out map has low ground mains connected to a high ground gas nat from which two ramps, left and right, lead down to the battlefield. One is a large wide open ramp, which promotes a "ramp-to-ramp" gameplay that will proceed in a diagonal fashion across the wide middle. The other is a small ramp blocked by low-value minerals. The "unblocking" of this smaller ramp has the potential to dramatically change the flow of the battle as a player can gain quick access to the "other" side of the battlefield allowing vertical gameplay or, alternatively, a foe can gain quick access to the opponent's main. The two high-ground side corridors lend themselves to "circle-and -attack-from-the-rear" strategies and also make the expo down from the larger ramp more vulnerable. This map received third place due to some balance concerns but it was the map that at the end received the most votes so it ended clearly as the most popular among our voters. And that is all. Congratulations Testbug, Flo and Nasty and also thanks to everyone else who participated and voted in this competition! At last! A gaming night, where nothing special is needed for a brood war game, except your good mood!!! What is "PsiStorm Fun Night"? Every week we will have one of those nights, where people from all around the globe, will gather to play every type of mode like: Free For All, Team Melee, Capture the Flag, Use Map Settings and more, also with some other special nights where we will play some fresh MODs for SC: BW, present it by maplantis.org community. We are also thinking of some other ideas, which we will reveled in near future. As for now we are thinking of making a concept for each night, where we will play a specific map/mode/MOD. First few weeks, PsiStorm.eu admins will make the concepts for those nights. After that a pool will be made, and users will vote for their favorite map/mode/MOD. At the moment we are working on PsiStorm TV, so hopefully we will be happy to see the most interesting games live in near future :) . So lets don't waste more time... Here is the information for our first night! 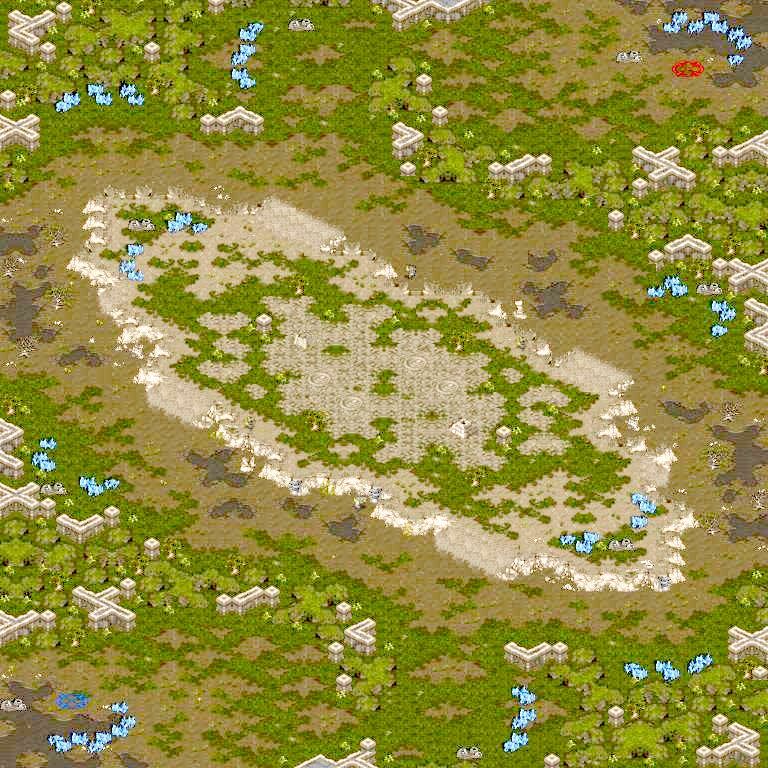 An incredible map made by Testbug from www.broodwarmaps.net! It's hard to give a comment for a 7 players map, and in this case it's even harder, because everything seems random, but... Not really... A lot of people will say "IMBA", but for a map like this, it surly needs a lot of testing to be able to say what is imba, and what not. In our case, we don't really care if it's imba. The most important is that every game on this map should give us really different, intresting and fun games! And thats what we need! I am really looking forward for this one! We already played it in FFA mode, and I REALLY CAN'T WAIT any longer for a mass gaming on this baby :D . Special extra thanks to Testbug, for his kind support by making an observer mode version of the map, where when you are eliminated, you will be given vision of all players! You also might like to see the map threat and comments here. You can download the melee version here, the observer version here and please give a credit to Testbug by uploading some of your own replays for this map here. We had an interesting competition with 9 great maps by Flo, Panschk, PsychoTemplar, Mapghost, Saurus, LostTampon and LML. 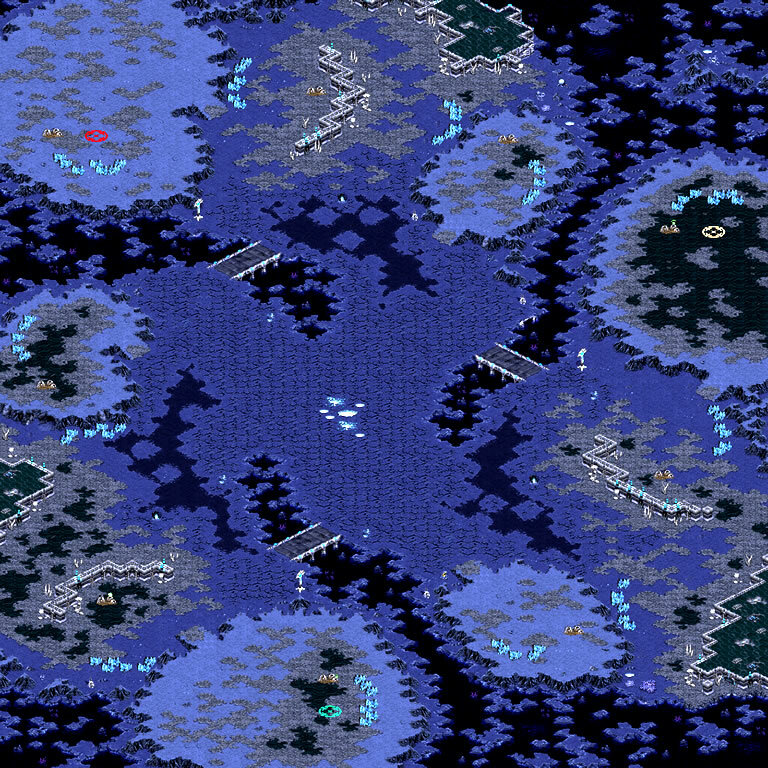 The maps displayed such experimental features as dwebs, swarms, creep, null tiles, dark templar blockades, a high and low ground "chessboard", mains where the building space is blocked by mineral blocks and a "ramp mound" at the entrance of the nat. Hopefully competitions like this will motivate the rest of you to also experiment with these and other features and figure out their best use for maximizing gameplay and enjoyment. But let's go on to the winners! 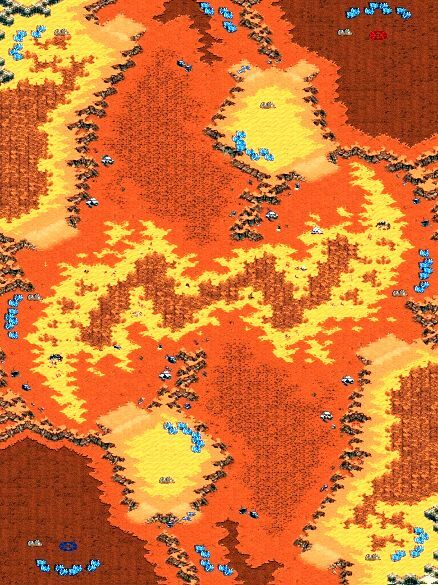 The same mapper that introduced dwebs and swarms to this web-site with his map "Avatar" (MOTM-1 2007) wins the competition with an older map of his. Earlier versions of this map were played in one of the Avaton tournaments held at gosugamers.net. Yes, we are talking about the map "Jericho" by LostTampon! When you are playing a 1vs1 on this map the first existentialist question to ask yourself is whether your foe is across the map from you as is the case of a diagonal or vertical matchup or just a "stone throw" away in the case of a horizontal match-up. Beware, if the latter is the case games can be very short! But the stretch of land between the mains is blocked by neutrals and mineral clumps at the borders and contains a field of dwebs. This setup lends itself to many possible strategies, as well as tactical situations that require quick thinking and equally quick action. The rest of the match-ups play like an island map, but there is a wide center for dropped units to roam and side gas expos and central minonlies if the resources behind your main are not enough. The second place goes to the map "Geerlux" by Saurus who with this map has contributed 13 maps to this database. The remarkable feature of this map is the many "8" value clumps of minerals blocking the building space at the mains which have to be cleared to make space for structures. Although at present it is not clear how this feature will affect gameplay, it is certainly an innovative idea to ponder. The horizontal match-ups that have the mains dangerously close to each other will also prove interesting to play, drop-wise, so to speak. Apart from the main and nat, the rest of the resources in the map are minonlies that are either blocked by a creep colony, or isolated from the rest of the map by neutrals with a nearby swarm to make them challenging to mine! 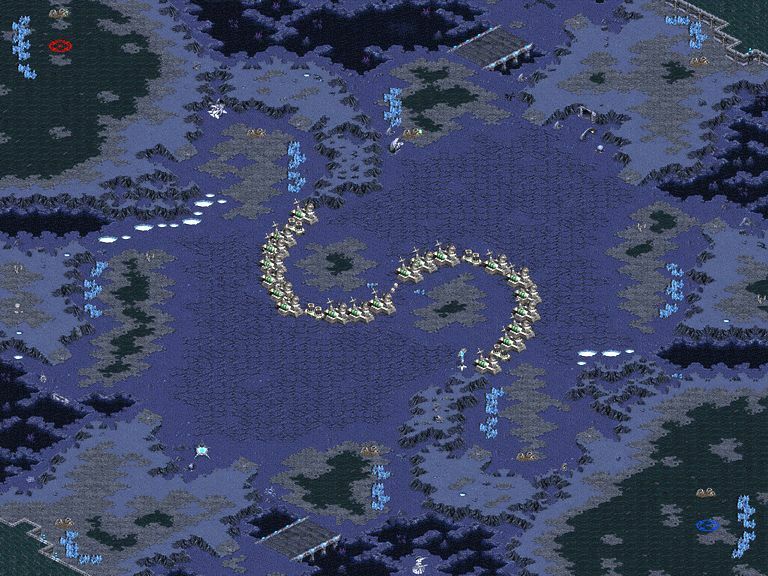 The third place goes to the map "Home of the Swarm" by our website God Panschk as modified by mapper extraordinaire flothefreak. A beautifully decorated macro map if you ever saw one. This map that boasts 1600 plus doodads has 4 corner high-ground mains with an unusual ramp to a low ground area next to the nat that can be used by dropped units to attack the nat or march into the main. 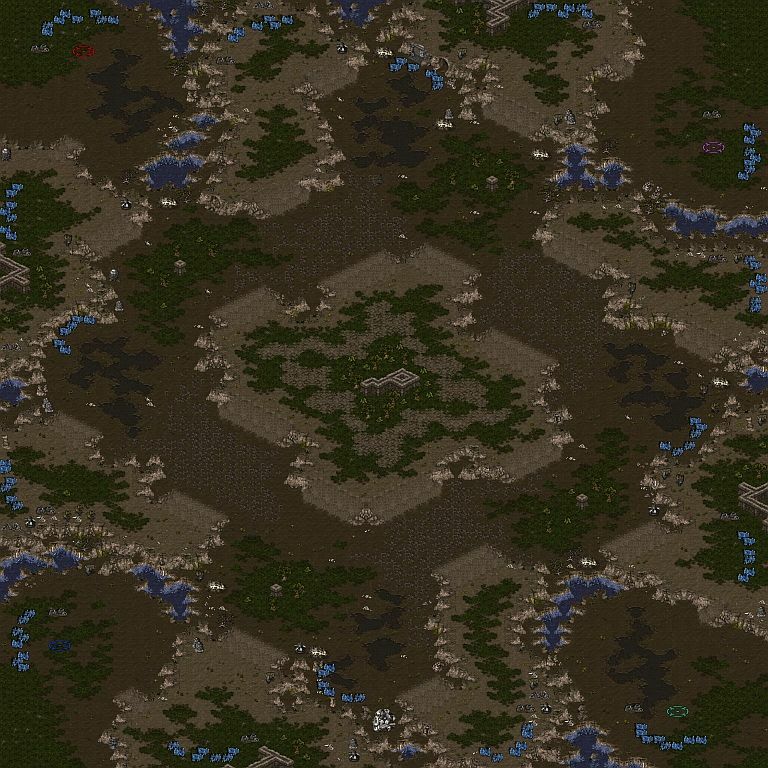 The other expos in the map are blocked by neutral zerg cerebrates or buildings. One additional feature of the map is several neutral zerg hero units that a protoss player can mind control. And finally the winner of the most innovative idea is Mapghost for his use of the null tiles. Mapghost introduced the idea in his map "Mazicolozist". Psychotemplar further developed this idea in his maps "Out of the Void" and "Chaos Darkness". Thanks for your participation Flo, Panschk, PsychoTemplar, Mapghost, Saurus, LostTampon and LML, and thanks to all who voted too. This competition would not have been possible without you! As we bring this competition to a close please remember: experimental maps are about the future, among the experimental maps of today lay hidden the ideas that will make the classic maps of tomorrow! To start, Map Of The Month for October! In no particular order, flothefreak's remake of Radix's Sound Barrier, and Testbug's Paranoid Android for three players are our first place-tied maps! Here is our own fuhrer's great execution of Radix's concept, Sound Barrier! This map is quite unique in its approach to a 2 player map. In the center of this map lies an 'S' of neutral buildings dividing the two players from one another. This 'S' is mostly made up of 2000 hp PsiDisruptors, with two power generators in the center of the 'S', and in 4 other locations a single power generator. These power generators complete the wall, but are easily removed. At a first glance, this map might look like it will play like an island map at first, just like Arkanoid. I assure you, the map is no more an island map than my mother is! The power generators will fall easily allowing for any kind of early game strategy you can think of, and the psi disruptors will fall not long after (if players choose to open them). The 'S' tightens the middle considerably, but the rest of the map is quite open, sporting strategically placed chokes as any good map might. There are expos all over the map, ensuring games lasting as long as you need. The map might seem quite macroish at a glance, but inability to scout initially can create a myriad of possibilities strategically to keep players on their toes. In addition to that, a cliff overlooking the nat also can create great harassment opportunities. This map is definitely worth playing: with its great execution of a unique concept, the map finds itself amidst the other great maps in motw and motm! Spam its thread here, grab the map here and its observer version here. Congratulations long-time-mapper flo for snagging another Map of The Something win! Here we have Testbug's Paranoid Android for three players! Testbug is known throughout bwm as the (3)map-maker, he is just, good at making 3 player maps, which is no small feat. Testbug making an epic 3player map which wins motm isn't anything new now, but what is new is how he did it. Who'd have thought to take a well-known two player wcg map, Paranoid Android, and remaking it for three players? At a first glance, it looks nothing like PA, except that it's twilight! But look closer! Testbug took PA's expo layout and redid it on a larger map for three players. The effect is great: even with the same expo layout, and several of PA's concepts such as the backdoor path from the nat through the min only, the gameplay is completely different. The backdoor should keep players trying to 100% macro their way through this seemingly macro map on their toes. Small bridges provide paths to the other players, just as in PA. Instead of a larger bridge to complement the smaller one, testbug uses a piece of land, ideal for the many battles and skirmishes the map will boast. These bridges create great strategic chokes, and can buy time to make the difference in a game. With PA's expo layout, great execution of a three player map, and testbug's magical decoration, this map is surely worth playing. You know the map must be good when it ties with a map of Flothefreak! Here's our second place for MOTM, Flothefreak's FrostyFortress! This map at one point was in first place, so you know it's got to be good as well. What kind of map can compete with that of flo and testbug? Another map of flo's! First time you look at this map, you might wonder, what the hell is so special about this map? It's just another macro map, only on 128x64, with short distances, a very intelligently placed expo layout, great execution and design... oh, that's what's great about it! This map has a macro-map's expo layout, and a micro-map's design all put together. The distances are so short, that you're guaranteed to have a lot of back-and-forth action. It's easy to reinforce your army, but also easy for your enemy to increase his army's size quickly at the same time. Make a mistake, retreat, or be pushed back, and the enemy is at your door step! The distances create a need to micro your army well: every unit can make the difference from winning or losing the battle, and you can't just lose a battle, go home and turtle to max again. Try turtling, and you give your enemy a lot of money. Blindly waste units, and your enemy crosses the map in five seconds to get to you. Once he's near you, your nearby production has him pushed back again. Every skirmish could gain or lose an expo. This map encourages fierce combat with its macro and micro aspect. The map may not be perfect, but its great and exciting gameplay makes it well worth playing, and well worth the nearly prestigious second place for MOTM! Spam its thread, download the map and the observer version. Here is Protoss4ever's Rise of Teosomething! The map features a unique concept with great looks! Similar to the korean map, Nemesis, this map features mains which are in the corners, but not against the edge of the map, they're towards the middle a bit, and with their nats behind them, against the edge of the map where the main might normally be. These nats are much larger than in Nemesis, and have two entrances which don't lead to/from the mains, which are blocked by two neutral xel naga temples each. The expos outside of the main and nat are positioned in the compass directions (NSWE) against the edge of the map. They are between each player, so they are 'neutral' expos, not clearly owned by any one player. This makes them great to fight over, encouraging agressive gameplay instead of boring mass to max and go macro gameplay. You can't just take the expos in your corner, because the map has a neat expo layout. The map's expo layout almost reminds me of Dalhia of Jungle, but the mains are in the corners and the expos in compass directions. This map looks great, and has a unique concept with decent execution, easily getting this MOTM's third place. And now for something completely different! MOTM is a great part of bwm, but the other competitions are nice too, for they encourage the making of maps with unique features or concepts. Time to end Nightmarjoo's no-end competitions! For this competition, the map I liked the second most was Nureru's (3)Venus Illegitima. The map was not as well decorated as flo's, but flo is a much more experienced mapper so I wouldn't expect it to be the same. The map lacked a little execution imo, but I liked the concept, and that it came from a fairly new mapper (at the time). The map features a double gas main, backdoor expo with gas, and a gasless nat. This is unique because double gas mains aren't that common, and the main is lowground with the expos on highground, and usually it's the other way around. A highground nat with lowground main can sometimes make it difficult to get up to the nat, but the backdoor expo or the double gas main gets rid of that potential problem. The middle is nice and open, ensuring that the gas-rich nature of the map doesn't hurt gameplay. Outside of the nat though, the expo layout is not as nicely done. The highgruond middle expos are somewhat neutral, and somewhat not, and the two lowground corner expos are kind of poorly done; there's a general lack of positional balance with the rest of the expo layout. This map could use some improvement, and imo is worth the time. I think this is a great idea of a map, but it just wasn't made with top-tier execution. Testbug's Endless Fields is the winner of the second competition. The map is a great map, it's even a motm. The idea behind this competition was for mappers to create a world which looked like colonized natural world. That is, that the map would look like it was a natural world worthy of the first competition, and then it was settled/colonized/terraformed by people. This was a harder to-do competition, and I think I explained it poorly initially. Flo gave a try at this one, but I wasn't convinced by his map visually, and didn't really like map itself. When I opened Endless Fields in starcraft, it was like, wow. 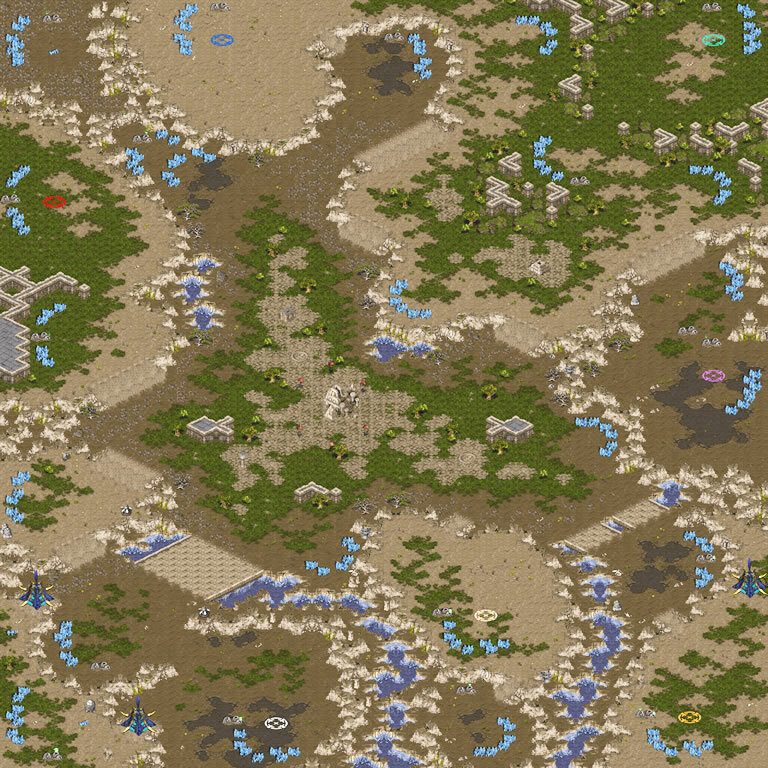 Testbug's use of terrain hit the natural look very well, he always does that. The map looks just as if the protoss or whoever showed up on this natural world and erected their temples all over the world, walling-in the precious resources. This is pretty much just what I wanted for this competition. The map has competition-winning-worthy aesthetics and layout, and motm-winning-worthy concept and gameplay. What more can you ask of a map? I'm tired of writing Thread and Map, and wonder where the Obs Version is. A front page reminder and note: For those of you who want your maps tested, and/or want to play on other bwm maps, op bwmn in europe has a bot running in it and stuff to encourage use. Tell all your friends about it, op bwmn on europe! There are several threads in the forum about bwm mappers' msn/aim/bnet screennames, so you have no excuse to not test your maps! The Awesome Panschk has opened up a starcraft 2 forum, it's below "off topic" and above "search forum", and about directly across from the two tabs for Broodwar.de and sc.gosugamers.net on the left side. Feel free to talk about sc2 here. Discuss what you want to happen with bwm once sc2 comes out, what ideas you want for the new sc2 mapping site which will ensue sc2 coming out. Congratulations to all the above-mentioned mappers, in no particular order: Nureru, Flothefreak, Testbug, Protoss4ever, and Radix! And kudos for Nightmarjoo for typing all of this up, and to Panshck for being amazing as always!